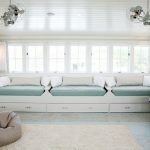 I love our bedroom, I really do, but given the opportunity I’d trade it in immediately for this one designed by Urban Grace Interiors. It’s just so restful and serene, I’m sure my dreams would be so much sweeter here! Love those dark floors, pretty walls, and comfy linens. And the dressers…LOVE those! That’s it for my scheduled posts! If things go according to plan, I’ll be back from vacation and here with you tomorrow! I hope you enjoyed all the posts while I was away! Oh, Erin.. you're so sweet for preparing posts even when you're away. Thank your for thinking about us. I want that color (walls) in my bedroom. Love it! It is such a serene, lovely, restful room. I love the work of art! 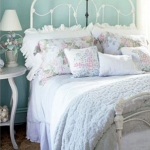 beautiful bedroom…love the aqua walls paired with the freshness of white…. This is a beautiful bedroom. I love the art and wish we could find out who the artist is! Love this bedroom!!! We're thinking of building a house in the next few years and I'm trying to find some ideas decorating that are kid friendly (like no white or off-white couches). Do you have any ideas? We hope to have lots of little kids running around the house! Hope you had a great time! 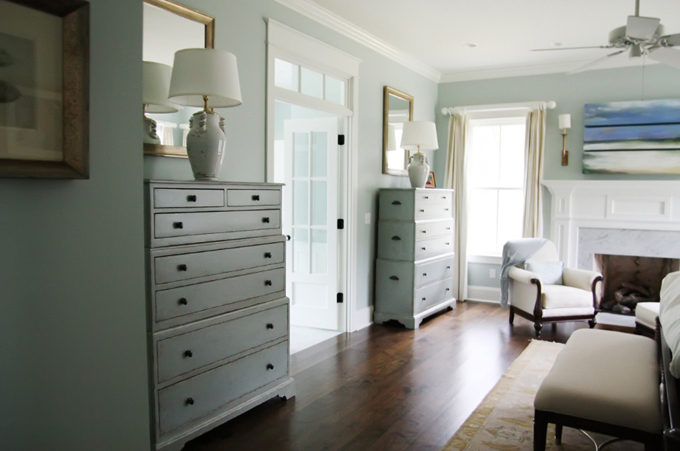 Love this room not just cause it's beautifully designed but because it gives us his and her dressers. Very thoughtful. I have been going back and forth on flooring colors. THIS is the one! My husband will love you forever…since he's the one that's been hauling boxes of floorboards back and forth to the store. Thank you! Love that paint? I'd love to know what color that is?! 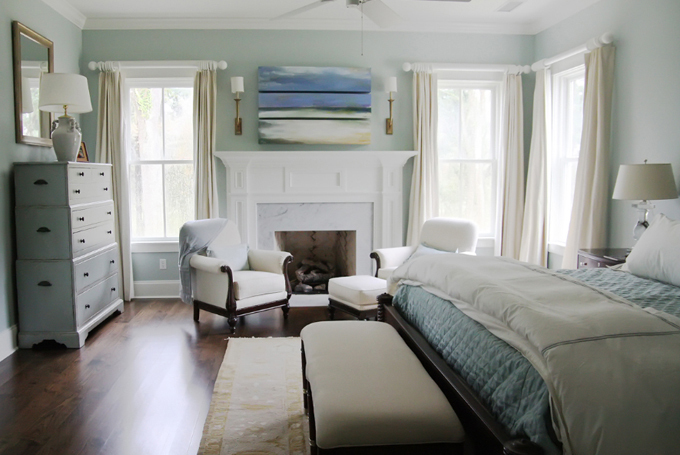 This bedroom is really peaceful; I love the painting above the fireplace. Erin, hello! I love the recent posts that I have had the chance to catch up on. This one is so calming and so very pretty! So happy I found your blog, following you now!